Our friends at Fantha Tracks has uploaded a full video of the Hasbro panel from NYCC on YouTube. Check it out. A couple months ago we saw the tease of the upcoming Han Solo and Chewbacca Toybox figures from the Disney Store. Now, a report from Fantha Tracks has revealed a third figure on the pamphlet included with the new Marvel Ant-Man figure: Yoda! Our friend Matt Booker from Fantha Tracks directs our attention to this article regarding Toys”R”Us impending collapse in the UK. It’s fate may be decided as early as Tuesday. 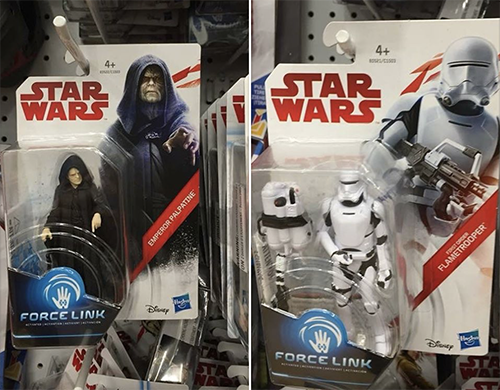 Our friends at Fantha Tracks have reported via Facebook that there have been sightings of the new wave of Force Link collection Emperor Palpatine and First Order Flametrooper (orange wave 3) at ToysRUs at Reading Gateway in the UK. Working Title for Episode IX Revealed? Our friends at FanthaTracks.com have posted an exclusive reveal, claiming discover of the working title of Episode IX. Star Wars fans around the globe will be rejoicing as a network of Star Wars enthusiasts return to the fold with a new venture – Fantha Tracks. Dave Tree, Mark Newbold, Brian Cameron and Matt Booker are all respected members of the Star Wars fan community. Having spent seven years as the daily content manager for Jedi News, Mark felt that now was the right time for a fresh challenge.